The internet is gradually becoming an assertive evangelisation tool and one of its early adaptors is the Diocese of Kumbo.In this interview Fr Robert Tanto, incharge of Social Communications says among others things say many priests and lay faithful are not showing much interest on the internet. Father, we understand that you are the brain behind the installation of the internet in most parishes in the Kumbo Diocese. What motivated you to embark on such a project? I have always strived to use existing media and seek new ones to communicate the message of the Gospel, especially to young people. In many ways, these young people have helped me to be forward looking, somewhat of a visionary. Modern communications, particularly the internet, do not only offer us a variety of media with which to transmit the Good News but have given birth to a ‘new culture’. How could a catechist, like me, or anyone involved in the work of evangelisation, hope to integrate the message of Christ into this culture if he fails to use the means available, which are responsible for the new culture? That is why I use the most appropriate means to answer the challenges posed by the new culture. Working with young people I felt the challenge to be always creative, inventive, looking for the “in-thing” and being up to date, at least, in the knowledge of fashions, styles, expressions and so on. The spirit to embrace new methods and try new skills was daily nurtured in me. The progression seems to me only natural: I used chalk a lot when I depended on the chalk board to get the message across; I used paper an awful lot in group dynamics, then I waded into what I consider the age of the audio tape. I collected loads of tapes and a wide range of musicians that were in vogue in the 60s and 70s; then came the age of the telephone, the camera, then fax, then computer, computer fax and the internet is the latest, the most inviting perhaps, but also the most challenging of the media. It is now the “in-thing”. And attached to it is the Digital Camera! It all comes to me as a process of growth and advancement in my job of communicating the message of the Gospel. The internet needs constant back up technical services. Do you have the qualified manpower to provide these services in Kumbo? For technical services, we have a well trained, very dedicated young man at the service of the diocese. Mr Bernard Kong was groomed by the Diocesan Youth Ministry of Kumbo. We have a partnership with the Diocese of Limburg in Germany where he was trained and came back home to set up the Diocesan Printing and Communications Centre (PCC) of which he is the pioneer and current Manager. He offers in-service training to those with whom he runs the Centre. We have another young man, Bernard Afor, whom we sponsored to train at Bamenda to run the Binju-Nkambe Internet Café and maintain the system. There is Denis Tarawo, who manages the Cyber Café at the Diocesan Youth Centre, who was also trained in Bamenda With the services of these three we do manage to keep our set up and running, although we do not hesitate to call on outside assistance when the need arises. How accessible is the internet in the Kumbo Diocese to priests, the religious and other lay pastoral workers? Priests, Religious and all Lay Pastoral Workers serving in any office in the Bishop’s House Complex now have computers and internet service as a regular component of office equipment. Currently, there is a study to extend the internet services of PCC to the Diocesan Pastoral Centre and to the Minor Seminary in Kitiwum. Priests, religious and lay people have easy access to the Cyber Cafés situated at PCC (near the Diocesan Garage) and at the John Paul II Youth Centre. Priests are even offered browsing time at a rate lower than the general public. The Binju-Nkambe Cyber Café in Nkambe Town is open to the general public including priests, religious and lay pastoral workers. The browsing time at Nkambe is cheaper than at Kumbo and has the same rate for all. Although the internet services have been put within the reach of everybody, there are, unfortunately some priests and religious and lay pastoral workers who do not show any interest in it at all. Does the Diocese of Kumbo have any comprehensive policy or guidelines as far as the internet is concerned? As I just said, some priests and pastoral workers do not show any interest in the internet, not even in the use of the computer for regular work. Quite a few blame their lack of interest on the lack of computers in the places where they serve. As of now the Diocese of Kumbo does not have any comprehensive policy about the use of the internet. The former bishop strongly advised priests to get into the use of computers to run their parishes and even indicated that the responsibility devolved on the Finance Committees of Parishes to budget for and acquire computers for the parishes. But I suppose it takes a very interested priest to convince his Finance Committee that such an expensive gadget is a worthwhile investment for the parish. The internet poses enormous challenges not only to contemporary society, in general, and the Church, in particular. What measures, if any, has the Diocese put in place to ensure the appropriate use of the internet by its faithful? The Diocese has taken steps to make the internet accessible to many people, which is an indication of the Diocese’s appreciation of this tool in evangelisation. Apart from the services offered at Kumbo and Nkambe, there is also a website for the Binju-Nkambe Parish, which is being visited by many people all over the world; there is also the Kumbo-Limburg website, which opens up for study and understanding the partnership that exists between the two dioceses. Apart from the courses offered to young people at the Diocesan Youth Centre, at PCC and at the Girls and Boys Town Cyber-Café of Binju-Nkambe, there is little or no formal training for priests, religious and lay pastoral workers on the use of the media and of the internet in particular. People need training to be able to use the internet in their work. Some have never looked at the websites I just referred to, because they are not able to face the technology. There is a great but unanswered need for professional training for those directly involved in the media. They need both doctrinal and spiritual formation to be able to function appropriately in the media for the good of the Church. One notes with regret that the internet tends to distance children from their parents. Some parents even attempt to stop their children browsing. That is futile. There is no stopping of young people and children becoming more familiar with the internet than their parents. And since most parents are basically internet illiterate, one would expect our schools to teach the young children who come to them the skills to use the internet so as to distinguish the bad from the good and make right choices when they eventually get fully exposed to it. What is the situation in our Catholic colleges? Our Catholic Colleges are not yet including internet fee in their tuition or providing internet services to their students. This, to me, constitutes a loss of opportunities for the young people who attend our schools to receive proper education in the use of this new technology. I think this is a dangerous neglect. The argument that we may lose students if we increase the fees by including an internet-use levy is not credible to me. We are probably losing students to other institutions because we fail to provide access to the internet which they easily find elsewhere. By failing to provide them with adequate and relevant internet and computer training, we are failing to prepare them to face the world that is increasingly becoming ever more secularised. I believe that if we want our young people to be the good and successful citizens of the state and the church today and tomorrow, then we must train them in the use of modern technological innovations such as the internet. Listening to you, Father, it would seem not much is being done in the Kumbo Diocese to promote evangelisation through the internet. The two websites: for Binju-Nkambe Parish and for Kumbo-Limburg are small beginnings to do evangelisation via the internet. Celebrations of faith events that get put on the websites are read by many both in the country and out of the country. Many people have come to know our pastoral strategies through these websites. Interestingly, I noticed many non-Catholics browsing our website in Nkambe and writing questions to me about events they read on the website. Our sister Churches in Europe have appreciated some of the efforts we make locally and contributed to the building of our infrastructure, thanks to the information they get on the internet. The internet has replaced a bogus library in my case. I find very easy access to the documents of the Church, to Theological Discussions and Scientific Research. When I still ran Catholic Programmes on the Donga-Mantung Community Radio, the internet was my immediate source of Catholic news and meditation on various topics. The feedback I got was that many people who listened to my radio programmes got attracted to the Catholic Church, or at least got a little insight into what the Catholic Church is all about. A lot more could be done if more people learnt to use the internet. What future for the internet in Kumbo? I think the internet has come to stay. The challenges are enormous, but it is one of those things which tend to survive better in difficulties. You see, the internet department of the Girls and Boys Town Project in Binju-Nkambe suffered terrible damages by lightning. For four months, it was out of function. Many said it was Father Tanto’s business and since Tanto was moving to Tobin the service had ended. But because the users had been exposed to so much and had come to depend on the internet for many things, many of them kept appealing to us to make it work again. We did reinstate it at a terrific cost. But the good news is that more young people are registering for training, and the users are pouring into the café. The Church has always been at the forefront of communication because her essential mission is to communicate Christ to the world. That is how she is missionary and not maintenance. It is a fact of history that from the time of Christ the Church has never fallen behind in her choice of the best means to communicate Christ. The Church cannot begin now to take half measures and go for the second best. The internet is not the only means of communicating Christ to the world but it is the most appropriate means to integrate the Good News of Jesus Christ in the new culture in which the Church finds herself. The universal Catholic Church is reaching out more easily by means of the internet; the Church in Cameroon cannot afford to stay out of this outreach. The Tobin Quasi Parish Church is under an Ecclesiastical Ban after thieves defiled the sanctity of the church and made away with the Blessed Sacrament. While investigations and fasting are underway to uncover the perpetrators of this hideous act, Catholic Christians are yet to come to terms with such effrontery. Similar acts were reported in Molyko, Buea and Bangangte last year. The reasons behind the increasing interest in the Blessed Sacrament remain a mystery. On Thursday 4 October 2007 the Tobin Quasi Parish Church in Kumbo was desecrated as the Blessed Eucharist stolen from the tabernacle where it had been reserved after the 6 a.m. Mass. The theft was discovered by Reverend Deacon Edwin Kinga, who had been assisting Father Evaristus Kiven at the 6 a.m. Mass. The Rector of Tobin Quasi Parish, Father Robert Tanto came in that morning from Nkambe and celebrated the Mass for the students. It was not until after the singing of the Our Father that Reverend Kinga, after solemnly bringing the ciborium from the Tabernacle and opening it on the Altar that he had the shock of finding the ciborium totally empty. He immediately alerted the celebrant that something had gone wrong in the Tabernacle. After discovering the theft of the Blessed Sacrament, Father Tanto informed the Vicar General, Father Roland Berngeh, as well as the Chairman of the Parish Pastoral Council, Shey Julius Ngalim. When news of the desecration spread in the Diocese, priests from the Kumbo Deanery as well as a cross section of the parish community came to see for themselves. Father Roland Berngeh explained the implications of this act for the entire parish, indicating that since the Church had been desecrated, it would have to be cleansed before it was fit for Holy Mass and the preservation of the Blessed Sacrament. He then pronounced the ecclesiastical sanction of suspending Holy Mass and Communion from the Tobin Church until the cleansing ceremony has been made. He then urged the parish to pray and fast while investigations on who had committed the act were going on. The Church is expected to be blessed and opened again for celebration on Sunday 14 October. A Commission of enquiry was then set up to investigate the current theft and desecration of the Church. The Council agreed that until the stolen communion had been found, families and individuals should pray at 9 p.m. for the discovery of the stolen host and the restoration of Tobin Church to a Eucharistic Centre. The Rector of Tobin Quasi Parish, Rev. Fr. Robert Tanto has expressed worry and dissatisfaction with the lack of security that led to the desecration of the sacred species from the only Eucharistic Centre of the parish and in broad daylight. He regretted that the theft of the Blessed Sacrament had happened when the Bishop was out of the diocese. He urged all to work hard and work fast on the conditions given them by the Vicar General for the Church to be blessed and used for the celebration of Holy Mass on 14 October. After 50years of effective service as a priest, the vicar general emeritus of Kumbo Rev. Fr. Peter Watson remains energetic and ambitious in work to serve the people of God. News of his number of years in the service of the lord took many by surprise at jubilee mass in Kumbo. At 74 years old and having answered his call to God faithfully and with great commitment, Rev. Fr. Peter Watson remain to be a loyal servant of God’s people ready to answer His call wherever he is called to serve Him. Also with 50years of actively serving God, it was time ripe enough for him to stop and thank God for the years already put in and or the love He has shown him. Celebrating 50years of successful priesthood for Fr. Peter is not marking an end to his loyalty to God but a sign of readiness to turn over a new page in his life as a priest. In a homily at the mass by Rev. 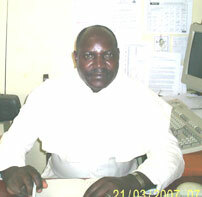 Fr Roland Berngeh; the acting vicar general and Canon of the Kumbo Cathedral, Fr. Peter Watson remained very anxious after his ordination to come out to the mission land in Africa and answer his call to God like Jeremiah. His ambition to come out to Africa on missionary assignment as a Mill Hill Missionary has proven its worth in the work he has done. To him, the Jubilarian has no regret in his life as a priest but he has for all the years led a life of total freedom of poverty, celibacy and obedience to the service of Jesus. Having talked with Fr. Peter, there are key rules which he considered as number one things in life to come out victorious. He considered commitment to answer his call to God as an important aspect to success. He relied on the power of God to what He called him to do. The Christian faithful also supported him in his work very highly through the encouragement from them which helped him to go on with his work without disappointing them. The faith of his family and that of the people he lived and worked with was also an encouragement to enable him forge ahead. Knowing that the people prayed with him and for him, the faith and practice of Christian life ensured him that the Grace of God was with him. Fr Peter Watson too had a perpetual like for the priesthood. Celibacy which he strongly embraced gave him the freedom to be at the service of God’s people. With this he thinks that he has been spared the temptation of leaving the priesthood and never ever thought of leaving the vocation at all. In his prayerful life, he did his best to be faithful to the Divine office but did badly in terms of personal prayers. He celebrated the sacraments and preached the word of God regularly. As a priest, Fr. Peter was also an ordinary human being. That is why he testifies that he might not have built, also did ordinary things. At 50years in priesthood, he has no regret for anything but can only thank God for the good health he has enjoyed and continues to enjoy. He looks forward in hope to live and die a priest. To the Canon of the Cathedral of Kumbo, most people turn to close the book before the last page. Fr. Peter Watson’s live as a priest sets the pace for the young priests and lay faithful to follow. Each and every individual should always strive to fight to the end. The very important thing in our lives might not have been reached even at an old age. Who is Fr. Peter Watson? Fr. Peter Watson was born in 1933 in the northeast of England . He is first of six, (five boys and one girl). He started the minor seminary in 1944 and in the major seminary in 1951. He was ordained priest in 1957. He obtained a degree in 1960 and a post-graduate certificate in Education in 1961. From 1961 to 1967, he taught in St. Peter’s Minor Seminary in Freshfield. 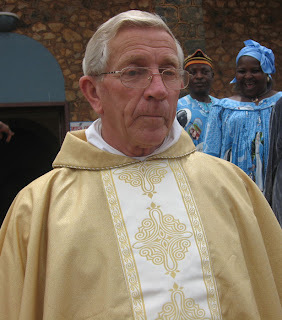 In 1967, he joined the Diocese of Buea and was appointed in November of that year by Bishop Peeters to Bambui parish. He as transferred to Sasse College in the Holy Week of 1968 and in July 1969 he was recalled to England to serve as Rector of a Minor Seminary. In 1971, he was appointed back to Cameroon to the new diocese of Bamenda and appointed by Bishop Paul Verdzekov to Bambui Parish. On arrival in Soppo he found a letter from Bishop Verdzekov askin him to teach again in Sasse College for one year. He arrived Bambui in July 1972. He was transferred to Big Mankon in March 1974 and that same year, he lost his father. He was transferred to St. Augustine ’s College Nso in September 1974 and to Tatum Parish in September 1975. in1979, he was made principal of the newly opened TTC Tatum. In 1980, he was transferred to Shisong where he served for 7 weeks in September and October before taking up duties as parish priest of Kumbo in November 1st. 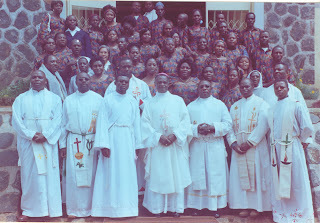 After the ordination of Bishop Esua in December 1982 and his appointment of Fr. De Rooy as Vicar General and Parish Priest of Kumbo, in January 1983 he went on leave and study leave for six months. He returned to Tatum as assistant parish priest in August 1983. he was transferred from Tatum to Sop in June 1991 and from Sop to Tabenken in December 1991. In August 1993, he was transferred to the newly established St. Aloysius Minor Seminary (SAMS) Kitiwum where he worked with Fr. Roland Berngeh. He was chosen as a Vicar General in 1997 and in 2001, was transferred from SAMS to Bishop’s House. In 2004 his mother died. 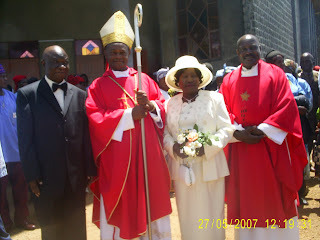 On the transfer of Bishop Cornelius Esua to Bamenda Archdiocese in 2004, he was appointed Delegate of the Apostolic Administrator, a position he handled until Bishop George Nkuo was ordained in September 2006. Since then, he has been serving in the Kumbo parish as second assistant priest. A total of 45 counselors to give counseling words of hope to people living with terminal illnesses and marital problems gone through a successful nine months course with the Diocesan Family Life Office of Kumbo. Equitably distributed all over the territory that makes up the diocese of Kumbo, more and more persons will begin benefiting from the services of these fresh minded counselors. The 13th graduating batch of this department has taken up the commitment to take up their work seriously. From a distant, if there was anything that exposed the joy of the graduating students on this 20th day of July 2007, it would have been the success story of their end of course in the counseling exercise. And so, the initiative takers came out on this long awaited day to celebrate and wave out the thorny moments they went through in the course of the training exercise. With a long list of challenges ahead of them immediately after the joyful graduation ceremony, Bishop George Nkuo of Kumbo thinks that it is time rip enough for them to implement in a diligent way what has been taught to them to the society. In a solemn Eucharistic celebration at the St. Jerome Biblical and Pastoral Centre, Kumbo in which he was chief celebrant, Bishop George called on the would be counselors to always make themselves available to people in times of need. As Christian counselors, he made them to understand that the greatest ritual they shall be expected to carry on shall be the ritual of human need. He cautioned them against the poor attitude of attending to their clients to judge and condemn them, but exhorted them to serve as a source of hope and inspiration through which the clients shall be reassured of the tragedies surrounding their health and marital homes. Taking into account that the 13th graduating batch of counselors were going to be Godly with their clients in their compassion and love, the bishop foresaw a handsome pay back of their work in the many people to be liberated from their too much worries. He ended his sermon with a carry home message in which he called on all the counselors to carry home with them the Mercy of the Almighty to those they were going to begin administering to them through their readiness to restore hope to the sick and to revive the marriages of the people. Within the mass, the counselors all pledged with God to be their guidance in their work while promising to keep the clients’ problems secret. Talking to participants at the celebration, the counselors through their representative Rev. Sr. Mercy qualified the outgoing batch as one with a difference. According to the address she presented to welcome the people to their graduation ceremony, the batch was one which contained the highest number of priests, Religious and traditional rulers to be trained as counselors. 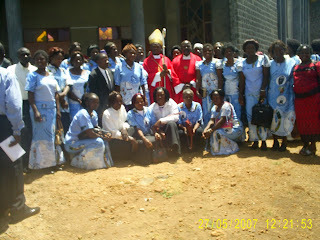 Apart from taking up the challenge to carry out their responsibility diligently by administering well to the needy in the society, the outgoing batch thinks that it is not yet over with the Diocesan Family Life Office of Kumbo as they go being ready to turn to the teaching staff at any time they need them for assistance. With the presence of traditional rulers in their midst, the counselors believe that this will solve another vital part in their area of work as they will help to sensitize other palaces of the cultural practices which speeds the spread of HIV/AIDS pandemic in the African society. Citing Jesus Christ as an all round preacher and considering the importance that counseling plays in our society today, the students called for more priests to get involved in the exercise to add counseling to philosophy, and theology to make their priesthood complete, a request they forwarded to the bishop. The students have congratulated themselves for the commitment and concern they showed one another during their stay at the diocesan family life office to receive training. Their various social, cultural and ethnic backgrounds posed no problem to their training session. They have however, recognized the contribution of each and every individual to their success during the time. To demonstrate mastery of the work they will be expected to take up shortly after the graduation, the students presented dramas and choral music passing across counseling messages. Created in 1982, the Diocesan Family Life of Kumbo has excelled in training counselors who are equitably distributed all over the diocese in the various parishes and helping the masses with their diversified ill health and marital problems. Our dear friends and benefactors, we say sorry for not giving you our news for a long time. Our internet equipment has suffered a heavy damage by lightening. We have not been able to render internet services since June 2007. It is, thanks to Fr Robert Tanto, that you are able to read this document. He has taken it to put on our weblog in Kumbo where there is internet service. Although our internet services have halted, we continue to run our services to the youth, especially training of boys and girls in computer technology and documentation services. We have been cut off from our beloved friends and the world at large since the 26of June. On that day, it didn’t rain but only a simple drizzle only was noticed. During that drizzle, a sudden lightening blast hit our set–up, damaging the Net Modem, the BUC and the back-up battery. We have had a technician from Douala to try to put things back in order. There seems to be no technical explanation for the damage, given all the protection that has been put around the equipment (lightening protection, “Telemachanique”, Earthing). What makes it worst is that, the brain behind the whole setup of this project, which is not only serving the youth, but the entire populace, has been transferred from Binju-Nkambe Parish. The users of this service incessantly visit the site to check if things are working. Most parents who have brought their children to do internet training during this Holiday are disappointed. Most people fear that if it does not work before Fr. Robert Tanto leaves, then that will be the end of the story. We pray you to be patient. If we succeed to reinstall the internet, we shall continue to reach you with news from our parish and the diocese. Pray for us as we struggle to get it going again. If anyone hears our cry and can support us financially to get up and start running again, we will be most grateful. The technician we brought in from Douala estimated the cost of replacing the damaged equipments at CFA 3.000.000 FRS (€ 4.615). If you want to make a donation to this project, please send it to Binju-Nkambe Parish GBT ACCOUNT FOR UNDERPRIVILEDGED YOUTH, BISHOP’S HOUSE KUMBO, CAMEROON. Thank you for reading and we hope you can help us. 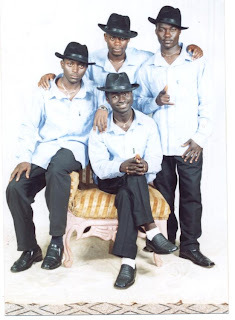 We are an all male acapela group born in April, 2004 in the small town of Nkambe in the North West province of Cameroon. After coming together and discovering our musical talents we decided to practise gospel music and glorify God. We started as 5(five) in number but are today 4(four).At some point two members left and our group was left with only three members. Later, one left and only two were left. (Fanka Leander Taju(De Dark) and Nsagha Kingsley (De Old). We were determined not to give up. We decided to call ourselves THE CUSTODIANS. We believe we have a call to UNITE the world through song. We believe in this way we are “Custodians” of the Word of God. We hope that by using our talents to sing we can unite people of our world. We can preach the Good News to them and help them to develop interest in the Word of God. Who knows, some who hear us may begin to live and behave the way Christ wanted us to live. Our group mainly sings religious songs relating to societal activities. We have written some fifty songs. Some who have heard us sing have testified that our singing touches them deeply. By song we have brought consolation to many: to widows, to the poor, disabled people and even people who do not know Christ. We sing in different languages and so are able to reach people who speak different languages. We sing in Limbum, English, and Pidgin-English. Our most recent song “Weti you go talk?” in Pidgin-English, meaning “what will you say?” has greatly ministered to many souls. We gained popularity by performing in public shows, organizing concerts, visiting towns, churches, singing over the radio, and so on. We are the best known Capela Group in Nkambe!! Our group is made up today of four members including two old ones (De Dark (Fanka Leander Taju), De old (Nsagha Kingsley), Nformi Terence Ngah and Chia Killian Chia. We sing harmoniously in four voices!. Our biggest concern now is to release an album of our songs. We have been working at this for the past two years. We came to this because wherever we sing people want our music on CDs so that they can continue to hear us when we are no longer on stage. We have no producer to popularise our music. However, with our limited resources we have been able to complete only two out of ten songs in the studio:”Prostitute” and “Weti you go talk?” We hope to release a video album after releasing an audio album. As we do not yet have any sponsorship to fasten the production of our music albums, we plead with our fans to be patient: “BE PATIENT BECAUSE GOD’S TIME IS THE BEST”. We are members of the Baptist Church, but we have been given a very warm welcome by the Catholic Priest. We are very grateful to Binju-Nkambe Parish for giving us the space to introduce ourselves on their parish web page. Even though the preparations for the Bishop’s visit were reluctant, when the parishioners heard in mid May that the Bishop had postponed his visit they were very disappointed. The Bishop had returned from the US and passed on to the Holy Land. Some parishioners simply relaxed and hoped the visit would be postponed for a lot longer. When, only a few days after announcing the postponement of the visit the people got word that the Bishop had returned from Israel and was bent on visiting the parish even if only for one day, many parishioners were confused. The Bishop arrived quietly just before 4 p.m. on Saturday 26 May. A brief but heavy downpour announced his arrival. Those who were still dragging their legs to go meet the Bishop on the entrance to the parish were displaced. Shortly after his arrival a little crowd gathered. Members of the Pastoral Council soon filled the presbytery and a meeting was held with the Bishop. After listening to a presentation of the parish by the Chairperson of the Pastoral Council the Bishop rejected the parishioners’ continuous reference to themselves as a “Parish of Primary Evangelisation”. After 52 years of existence the parish cannot continue to be one of primary evangelisation. He admitted that the Christians in the parish were not as dynamic and alive as they should be. The Bishop rejected the claim that the people were poor, and told them the problem was one of weakness of faith. What was needed in the parish was to find new ways of evangelising the people. Responding to the complaint that the few members of the vocations group were sometimes discouraged by those who should be encouraging them, the bishop said that those who felt called by God should keep in mind that God was expecting a personal and direct answer from anyone he called. They should not let anyone discourage them. During a Pontifical High Mass on Sunday 27 May the Bishop confirmed 30 candidates and witnessed the renewal of the marriage of John and Mary Tadoh. In his welcome word the parish priest, Robert Tanto thanked the Bishop for coming for the third time this year to their parish. He believed this monthly visit by the Bishop was a source of great encouragement to the parishioners. In his homily the bishop shared his emotions at visiting the land where Jesus lived and worked. He said, “I touched the stone at the tomb of Jesus, kissed it. When I did so I prayed for all the priests of this diocese, all the Christians of the diocese, and particularly the Christians of Binju-Nkambe who would be the first parish to share the blessings I was to bring back”. Focusing on the 30 who were receiving the Sacrament of Confirmation the bishop said he was impressed by the number. He said he was not looking for large numbers at confirmation but for truly committed Christians who were willing to work for God. A very special civic reception followed after Mass. Some people brought gifts to the Bishop and those who gathered shared a little drink and some fresh corn. The parish had chosen to make a contribution towards the reconstruction of the Carpentry Workshop which was destroyed by a fire disaster, and towards offsetting some of the high bills incurred by the Bishop during his travels to encourage the Christians in his role as chief pastor of the diocese. The parishioners were very happy to make their little financial contribution to the two causes rather than spend the money on a sumptuous lunch. Apart from the two envelopes given the Bishop, he left for Kumbo that afternoon with a car full of raw foodstuff and live chickens. The parishioners of Binju-Nkambe are still hoping to have the bishop back for a little longer, when he can meet the people in their different pastoral zones.